Raleighs were the patent-holders for the cross frame design, and the Modele Superbe X Frame was their top-of-the-line machine. The cross frame design arose because, in the 1890s, cheaply-produced bicycles were made by unscrupulous manufacturers, and the public was often conned into buying them; invariably they were sold at auctions or from classified magazine adverts, and many were so badly made that they fell apart within a week. I heard of one report of a cycling accident where a bicycle was split in two from behind. As a result of concern over the strength of bicycle frames, the reputable manufacturers had to find ways to reassure the public. Girder frames and cross frames were two ways for the companies to sell a bicycle that had visibly been strengthened, and both styles became very popular. A remarkable announcement was made in Nottingham the other night by Mr. Harold Bowden – managing director of The Raleigh Cycle Co. Mr. Bowden says that in consequence of the rejection of the budget and believing that the triumph of tariff reform is at hand, his company will immediately put all their men on full time. The firm will also embark on fresh capital so as to increase their stock. Company sales continued to increase and, by April 1910, the company found itself already 3000 machines ahead of any previous record, its weekly average being 1700 bicycles. Because of the company’s high production figures, Raleigh bicycles of this era are not rare. It is unusual, however, to find one as well preserved as this. It’s particularly interesting to observe its gold leaf detail because this has usually faded from the paintwork after a a century of a bicycle’s existence. Here it is featured at the 1908 Stanley Show. The article says: Diamond frames now find a place beside the familiar Raleigh cross frame, only one machine of this latter type being now made. The highest grade model is the ‘Model Superbe’ at 15 guineas in gents’ and ladies’ pattern, fitted with the Sturmey Archer three-speed gear. Observe that the Superbe illustrated in the 1908 magazine (above) has a front mudguard extension, while the model shown in the 1907 catalogue picture below still has the cut-off front mudguard. 1908 was Raleigh’s changeover year for mudguard extensions. I don’t have a 1908 or 1909 Raleigh catalogue. But this bicycle is the same as in the 1911 catalogue, below. The price between 1907 to 1911 was the same – 15 guineas. Observe the rectangular Raleigh lamp bracket; the ‘R’ lamp bracket was introduced the following year. 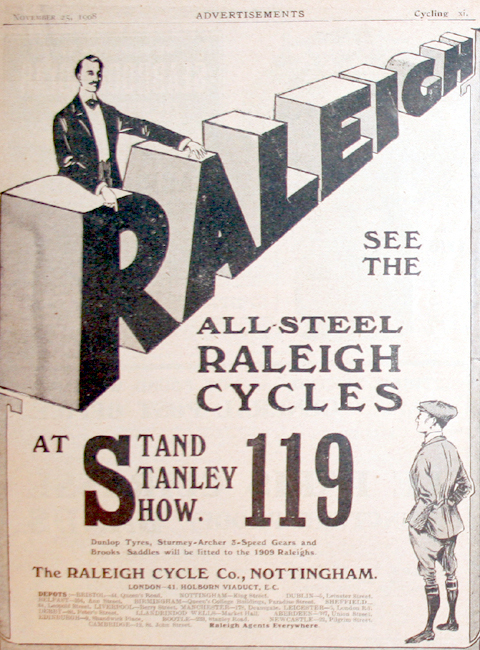 Raleigh heavily promoted their Sturmey-Archer gears; they were a major selling point in Raleigh advertising of the time. In 1908 Harry Green (above) rode 839 miles – the length of Great Britain – in a record-breaking 2 days 19 hours and 52 minutes on a three-speed Raleigh to publicise the company and the Tricoaster gears. The guide for calculating the age of raleigh bicycles shows the frame number 249,081 as being manufactured in 1909, while number 285,669 is 1910. As Raleigh is recorded as making an average of 1,700 bicycles a week at this time, the frame number of this bicycle (253,525), at only 4,500 more than the 1909 frame number, would definitely appear to be a 1909 manufacture. However, the Mark X gear fitted to this bike is recorded as being introduced in 1910. Of course, such information can only ever be approximate. For example, is the age of a bicycle its manufacture date or the date of its sale? This question has no answer. I photographed this Raleigh X Frame in Kipling Gardens, Rottingdean. I’m a child of the 1950s so I grew up with Kipling’s Just So Stories. In the sixties, however, his writing was considered too old-fashioned for the school curriculum, and he subsequently went out of vogue. I wonder how many youngsters today realize that The Jungle Book was written by Kipling, not by Walt Disney? Despite many of his stories and poems not being ‘politically correct’ for 21st century sensibilities, he nevertheless remains popular around the world, and Kipling Gardens has become a pilgrimage spot for international visitors interested in British literature.